This is my very first win at DesignContest.net. 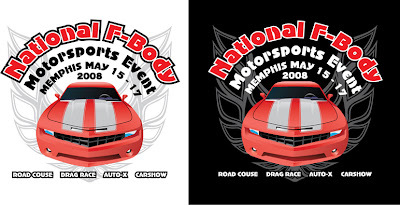 I used my Camaro Illustration for this contest. I made the text wrap around the top of the car because if it was straight there would been allot of open spaces. The contest holder wanted a Firebird included in this design so I made it to sit behind the car and colored very light. After the contest the CH wanted a banner that would have the same design as the shirt. So I made this, because there is no space on the top because a banner is very wide I made the text to be on on of the sides. After allot of testing I saw putting the text on the right somehow give a better look then on the left. I am very glad I finally won and its a very great experience.